Apparently in order to become Time's Person of the Year, you have to run a presidential campaign based on fear mongering and white supremacy. Way to go, Time! You've really outdone yourself this year. 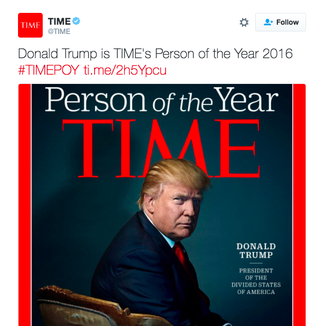 If you haven't guessed, Time has named Donald Trump its Person of the Year. And there's definitely some harsh comments being directed towards the "news" site. Anything for page views, I guess?